There is no document of cilvilization which is not at the same time a document of barbarism. And just as such a document is not free of barbarism, barbarism taints also the manner in which it was transmitted from one owner to another. A historical materialist therefore dissociates himself from it as far as possible. He regards it as his task to brush history against the grain. While open access has at long last entered the mainstream in the global West and North, it is a particular version of open access that is being taken up so widely. Open access is currently being positioned and promoted by policy makers, funders and commercial publishers alike primarily as a means of serving the knowledge economy and helping to stimulate market competition. This version has become so dominant that even those on the left of the political spectrum who are critical of open access are presenting it in much the same terms: as merely assisting with the ongoing process of privatising knowledge, research and the university. 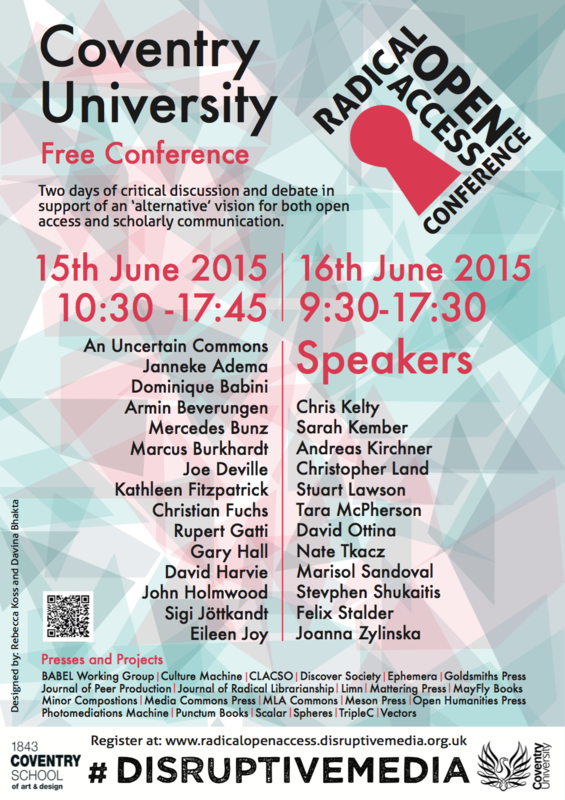 Rather than ‘working with the grain’ of neoliberalism’s co-option of open access, the Radical Open Access conference will reclaim it by asking: what is the potential for supporting and taking further some of the different, more intellectually and politically exciting, ways of understanding open access that are currently available internationally? A particular emphasis will be placed on those that have emerged in recent years, in the arts, humanities and social sciences especially. Radical Open Access will thus provide the impetus for bringing together many of those currently involved in experimenting with ‘alternative’ forms of open access: both to discuss the long, multifaceted critical tradition of open access, its history and genealogies; and to examine a broad range of radical open access models. As part of its refusal to concede open access, the conference will endeavour to strengthen alliances between the open access movement and other struggles concerned with the right to access, copy, distribute, sell and (re)use artistic, literary, cultural and academic research works and other materials (FLOSS, p2p, internet piracy etc. ); and to stimulate the creation of a network of publishers, theorists, scholars, librarians, technology specialists, activists and others, from different fields and backgrounds, both inside and outside of the university. In particular, the conference will explore a vision of open access that is characterised by a spirit of on-going creative experimentation, and a willingness to subject some of our most established scholarly communication and publishing practices, together with the institutions that sustain them (the library, publishing house etc. ), to rigorous critique. Included in the latter will be the asking of important questions about our notions of authorship, authority, originality, quality, credibility, sustainability, intellectual property, fixity and the book - questions that lie at the heart of what scholarship is and what the university can be in the 21st century.